I’m sure this is not a news flash: This is always a bittersweet time of year. From Thanksgiving through the first day of the new year…. IMHO, I believe it’s nearly impossible to be immune to the full spectrum of emotions….whether alone, or in a room full of people… during the holiday season. It can be a good, bad, or ugly time of year. And yes, the right side of the brain says “It’s YOUR choice” which adjective to embrace. Most of the time I’d like to say I’m focusing on the good…the Ho-Ho-Ho jolly…and not the bah-BLAH-humbug. Alas…I’m only human. I’ve got a long, long way to go on this journey of finding peace and acceptance. Some days I am better at it than others. On this day it’s more of a struggle than I’d like to admit. Yes folks…I’m sure you can hear those violins playing in the background! Maybe the funk on this day is due to the bleak gray skies and miserable freezing rain. I’m certain I’d feel infinitely more cheerful if it were snowing right about now instead of watching rain and sleet shower down on the brown barren trees. And there’s the fog too, enveloping…almost suffocating…. our home on Little Mountain…not a ray of sunshine peaking anywhere to brighten the mood. I think I have a case of SAD (Seasonal Affective Disorder). It’s real folks…look it up. So, one moment I’m up and the next I’m down. I’m quite sure I’m not the only one. There is some comfort in that. Another reason for the violins? Decorating the Christmas tree always gets to me. It never fails. And for some reason, this year it was more difficult. Rocket-man had little part in the process this year except to pull the tree out of storage and set it up. It’s not that he didn’t want to partake mind you. Work and travel commitments left him little time to do anything else. So it was up to me to pull the ornament boxes out and throughout this past week I’ve been decorating the tree on my own. What I used to be able to pull off in one night now takes a week. What’s up with that? 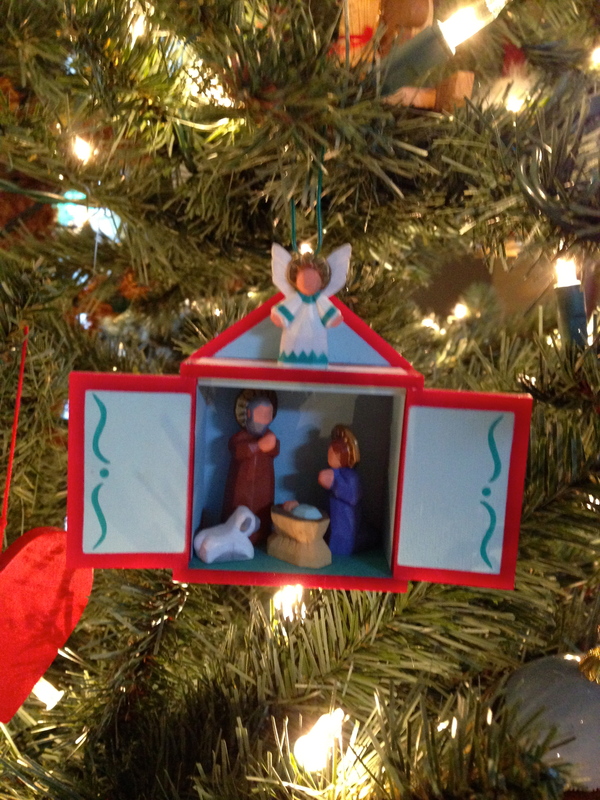 I love this Hallmark Nativity ornament! 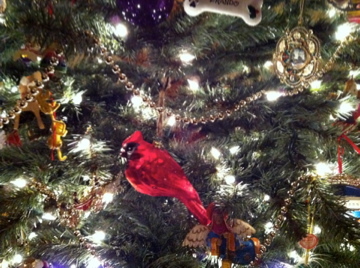 My red cardinal glass ornament always makes me happy! Anyhow, I’ve done this tree decorating business alone before folks! I have no idea why the violins are playing particularly loud today! You’re probably thinking that this shouldn’t be a cause for violins and you may be correct; I’m certainly not the only woman who has decorated a tree alone, nor will this be the last time for heaven’s sake (and I am certainly not immune to the fact that there are many military wives doing just that, or widows…or divorcees, etc).. Still, I can attest that Tuesday went just fine. Really! I pulled up Spotify on the iPad, found some lovely Christmas songs, and danced little jigs (to the poodle’s dismay, I’m sure) as I began combing through the ornament boxes. 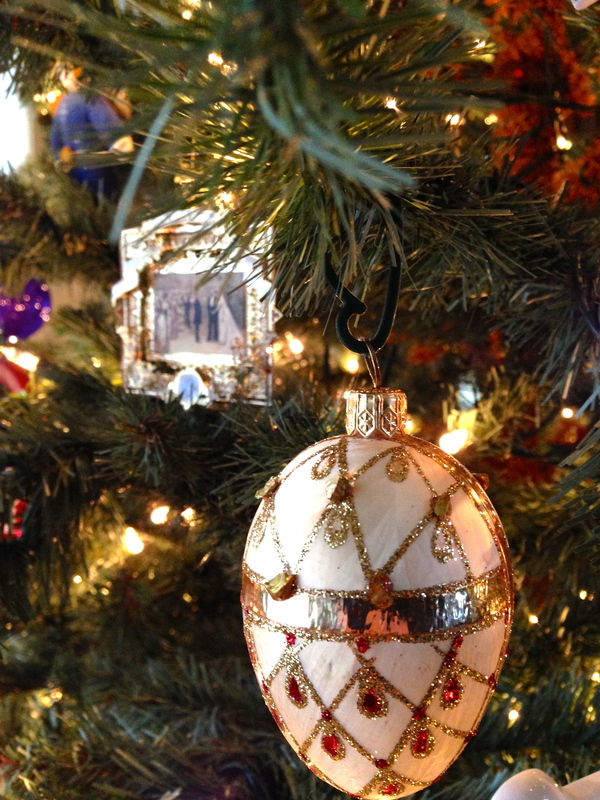 Yep…fifteen White House ornaments now. Wow. 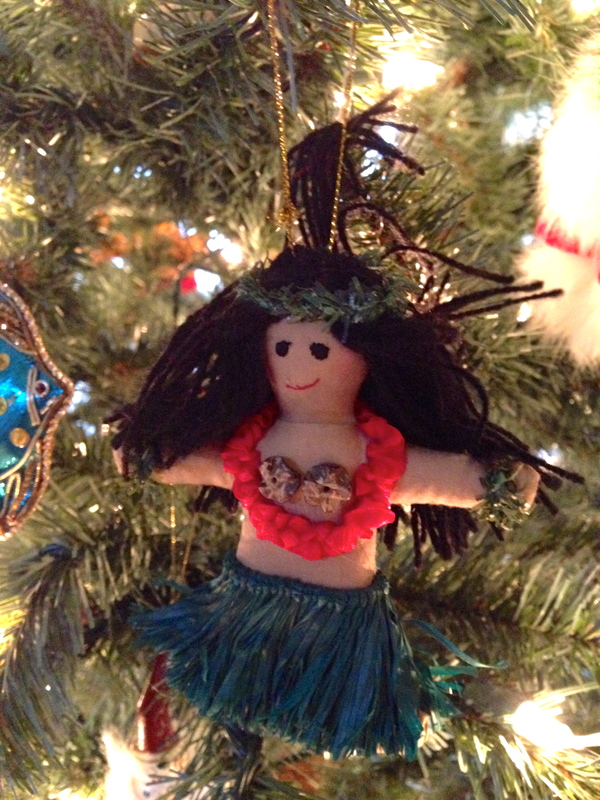 Oh… and here is the ornament I got in Hawaii! 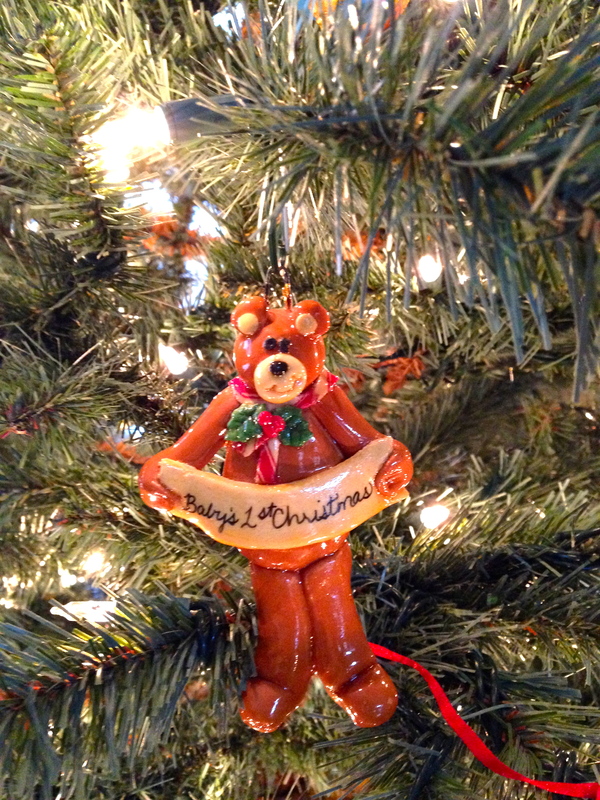 And here is my son’s first ornament… and my daughter’s first Christmas bear ornament too (I held that one back from her box of ornaments I sent her a couple of years ago). So…here it comes…the faint sound of a violin (let’s make it a Stradivarius). I squashed it best I could by cranking up the volume on “Grandma Got Run Over by a Reindeer.” The poodle went into another room. But Wednesday came along and with it a phone call that pushed the wrong button causing the floodgates of memories (and not the best kind) to flow, completely spoiling the decorating mood. The violins haven’t stopped playing. So here we are at Friday. 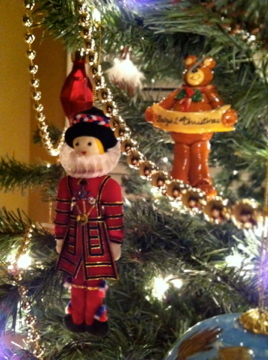 It’s just that with each ornament that comes out of the box, there is a memory of Christmases long ago. Christmases with children around, either eyes all a-glow, or even fighting with one another, or begging to hang an ornament often in absolutely the “wrong” place on the tree! How I wish I had been less obsessive like T.V.’s “Monk” and just let it happen….and sometimes I did, moving the ornament later when little ones were fast asleep. 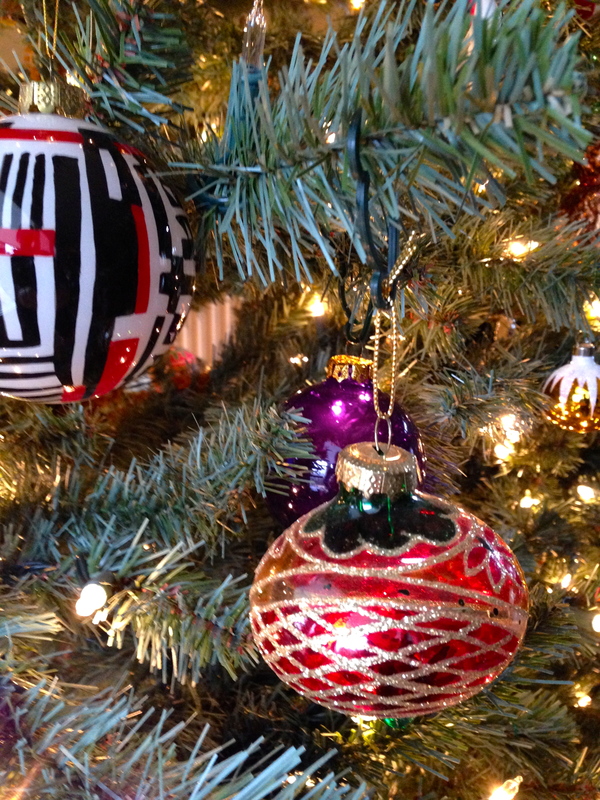 I had to have the tree look just right….sigh. Then came divorce….years of struggle….then re-marriage (a very good thing!) and now… the children are gone, doing their own things. Well…one is doing her own thing and the other…unfortunately he refuses to be part of us (another reason for the Stradivarius!). So, now it’s just me to fuss over holiday decorating and it hardly seems worth it without children around (even surly ones) to be a part of it all. Excuse me for a moment. I need to step away…. It’s time to…. smack myself OUT of my myself! This is not to diminish what decorating the tree means to my Rocket-man. I’m sure he’d rather be irritating the hell out of me by placing his Steelers ornaments on the tree (in the wrong place too) rather than taking conference calls on his day off. He has nothing to fear; the violins haven’t worn me down into the dark hole! I’ve smacked myself silly and had a chat with my sis too. So, I’ve left the gold tree beads off the tree, waiting for a time when he’ll be free and we can do this together. I can already visualize that time (which I believe will be in precisely three hours from now) and I can tell you it will include a glass of spirits (Bailey’s Irish Cream or whiskey for Rocket-man…I never know which) and Cognac for moi. See there. My mood is already lifting…..